Do you use Dropbox? If you don’t, you really should give it a look. If you do, chances are you aren’t using it to its full potential. What is that supposed to mean? Well, Dropbox is for more than just storing and synchronizing files across your various computers and devices. You can use it to do a whole lot more. A few months ago, Amazon came out with Cloud Drive and Cloud Player. They’re an interesting duo. Cloud Drive lets you store files online, and you can store any MP3s that you buy from Amazon in Cloud Drive. With Cloud Player, you can listen to those files anywhere. But who needs them when you have Dropbox? By combining Dropbox with a free service called DropTunes, you get just about everything that Cloud Player offers. DropTunes is an online media player that connects to your Dropbox account. All you need to do is upload some music files to Dropbox, log into DropTunes, navigate to the Dropbox folder that holds your music, and click Play. DropTunes has two interfaces: Flash and HTML5. Using the Flash interface (which is the default), you can only play MP3s. 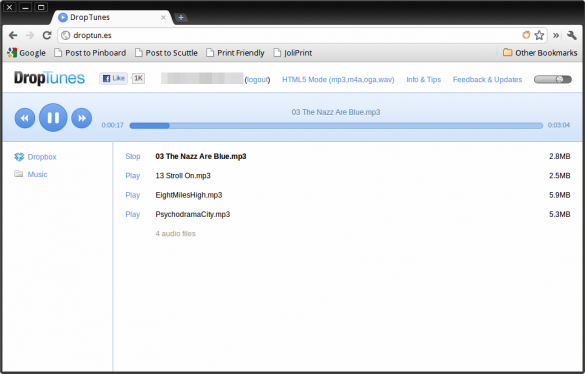 Using the HTML5 interface, you can music in the following formats: MP3, Ogg, Wav, and m4a. Everyone takes notes. We all jot down ideas, quotes, snippets of information, URLs, to do lists, all of that sort of thing. But the way in which we do it is kind of inefficient — everything is scattered across devices or in paper notebooks or on scraps of paper. TextDrop eliminates all of that, and makes what you’re jotting down available to all of your computers and devices. 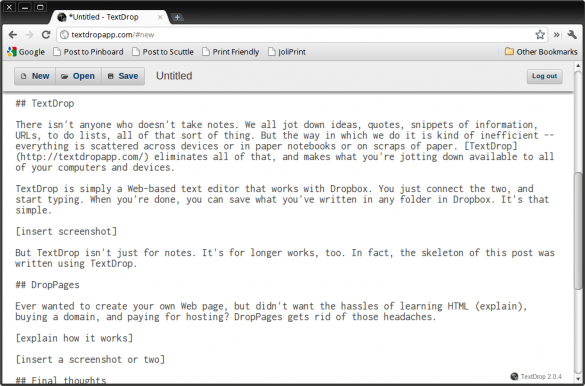 TextDrop is simply a Web-based text editor that works with Dropbox. You just connect the two, and start typing. When you’re done, you can save what you’ve written in any folder in Dropbox. It’s that simple. But TextDrop isn’t just for notes. You can use it for just about anything you write. I haven’t run into a size limit for notes, or anything else. In fact, the skeleton of this post was written using TextDrop. Ever wanted to create your own Web page, but didn’t want the hassles of learning HTML (the language Web pages are written in), buying a domain, and paying for hosting? DropPages helps get rid of those headaches. Setting up Dropbox and DropPages to play together takes a bit of work. First, you need to create a folder in Dropbox that will act as your domain — for example, scottnesbitt.droppages.com. 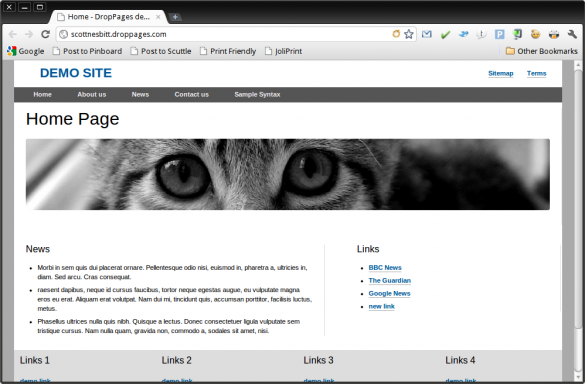 Then, go to the DropPages site and download a theme. The themes are the basic designs for your Web site, which come in a zip file. Extract that zip file into the Dropbox folder that you created. From there, share the folder with this email address: server1.droppages.com. You can learn more about the whole process here. The only drawbacks to DropPages are that 1) there aren’t that many themes available, and 2) to modify the pages in a theme you need to learn Markdown, a simple way of adding formatting to content for the Web. Luckily, Markdown is fairly easy to learn. 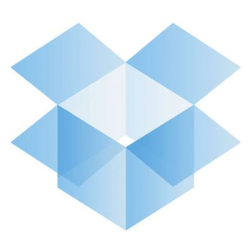 Dropbox is for a lot more than just storing files. And the apps that you just read about are just the tip of the iceberg when it comes to extending the power of Dropbox. You can find a list of more here. Do you use Dropbox? What services and utilities, if any, do you use with it? Share your favorites by leaving a comment.